There aren’t a lot of video games out there that let you punch dinosaurs in the face with your bare hands, but LEGO Jurassic World is one of them. It recreates all four Jurassic Park movies — Jurassic Park, The Lost World, Jurassic Park III, and the newly released Jurassic World — in the creative and goofy LEGO universe, allowing players to not only beat up dinosaurs, but also play as them. Somehow, the game manages to give the Jurassic Park franchise a fun makeover, but still keep all of its action-packed and memorable moments. LEGO Jurassic World allows players to play through each of the four Jurassic Park movies separately, starting, of course, with Jurassic Park. 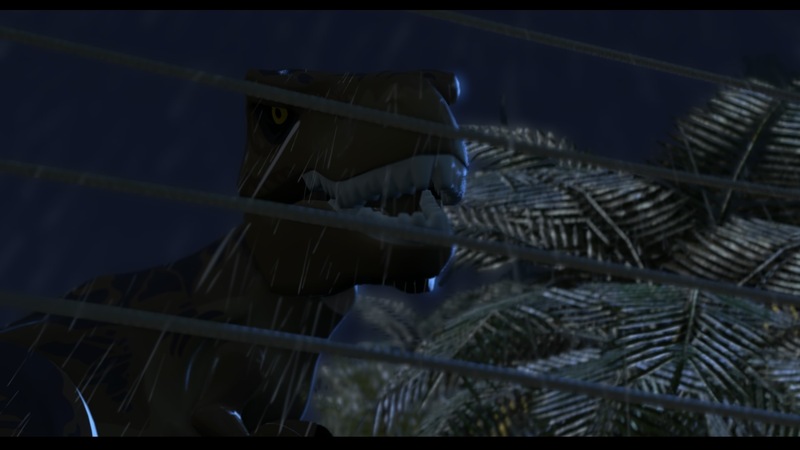 Players are able to play through the movies’ storylines, reliving some of the more iconic scenes in the movies as they do so, such as dinosaurs ending up in the city in The Lost World, or the raptors in the kitchen in Jurassic Park. Voice recordings from the movies helps bring the game to life, and random jokes and one-liners put in by TT Games helps keep the game goofy and uniquely LEGO. Like many other LEGO games, one of the main goals in each level is to smash things and collect little LEGO pieces, although there are a number of QTE sequences and chase scenes to break up the monotonous smashing and grabbing. Collecting a certain amount of them earns players the title of “True Survivor” for that level, and the little LEGO pieces can later be used to buy new characters and new vehicles. Also like other LEGO games, LEGO Jurassic World has a gigantic amount of characters to play as. Each character has his or her own special abilities, like Dr. Alan Grant’s ability to assemble fossils into useful structures or Owen Grady’s ability to sneak past dinosaurs. Players need to switch between different characters and use their unique abilities to get through the various levels, and while this is possible to do while playing alone, LEGO Jurassic World really wants players to play with a partner. While playing with someone else, the player doesn’t need to switch characters all the time, and the game becomes more enjoyable and easier to get through. Besides getting through the movies and playing through specific levels that mirror the movies’ plots, players can also explore four fairly massive open-world environments. Each environment connects with each one of the movies, and the corresponding storyline of the movie must be completed before players can fully explore the area. But once the story is completed and the area opens up, players can enter “Freeplay,” allowing them to play as any unlocked character and drive around in any unlocked vehicle. There are a number of different side-missions to find and play in the open-world areas, and they reward the player with various collectibles. While most of the side-missions are almost exactly the same — help a sick dinosaur, beat some dinosaurs up, or help a trapped human — they are quick enough to be entertaining, and do a good job of giving players something to do other than just play through the stories. Trying to complete on these side-missions turns the seven or eight hour game into one that could take 20 or more hours to fully finish. The only downfall of the open-world environments is the soundtrack that is used in them. While the story levels have a fairly dynamic soundtrack, the open-world areas simply just play the main theme song of whichever movie they are from. Like the iconic Jurassic Park theme song? So did I, until I heard it play 500 times while driving around Isla Nublar. It got so repetitive that I actually had to turn the music off, just so I wouldn’t go crazy. While most of what I just mentioned is what players can do in almost every other LEGO game out there, LEGO Jurassic World does offer players something unique — the ability to play as a dinosaur. By finding collectibles in the story modes, players can unlock and customize playable dinosaurs. Just like the normal characters, each dinosaur does something fairly unique. The triceratops can break through barriers, the velociraptor can access certain levers, and other dinosaurs can do other special things. The unlocked dinosaurs can also be customized, allowing players to change their colors, patterns, and even their facial features to create something truly amazing. I did notice, however, that playing as a dinosaur seems to bring out more bugs than usual. It’s no secret that LEGO games are often a little buggy, but LEGO Jurassic World seems to have more issues than the average LEGO title. Maybe it’s because the dinosaurs are much bigger than the normal characters, but I noticed the game had a really hard time with collision detection while I was running around as a dino. I often went through fences, walls, trees, and other things that should have stopped me in my tracks. Twice while playing as a triceratops, I fell through the ground and had to restart the game. The game even has a bit of trouble with collision detection while playing as some of the normal LEGO characters, as more than a few times I got completely stuck in an area and had to restart the level. Hopefully, a patch will come along and fix these bugs, but as for right now, they are fairly frequent. But, despite the bugs and the annoyingly repetitive soundtrack, LEGO Jurassic World is a whole lot of fun. Being able to relive some of my favorite Jurassic Park moments was fantastic, and being able to play as not only the movies’ main characters, but also the dinosaurs is something that sets this game apart from other LEGO games. If you’re a fan of either LEGO products or the Jurassic Park franchise, I recommend picking up LEGO Jurassic World. Create and play as dinosaurs. Fight dinosaurs with your bare fists. Four movies to play through.